Read Ellen's comments on local issues and topics here. Website paid for and maintained by Ellen Smith — in-kind donation to Ellen Smith for City Council election campaign 2018. About the blog, personal life, etc. Gene Dunaway submitted this letter to the editor to The Oak Ridger, and was told it was “too late” to publish. I love the way he expresses himself here, and I appreciate his endorsement of the incumbent “team” on City Council, so I’m publishing his letter here and on my Facebook page. We can all agree that Oak Ridge is not Mayberry RFD. We don’t have a Sherriff Andy Taylor. We don’t have a Barney Fife directing traffic. But we have a real barber, Jim Breeding at the Arcade Barber Shop, who actually cuts hair. We also share at this exact point in time, via paraphrase, a more congenial spot for happily-ever-aftering than here in Oak Ridge, Tennessee. While I don’t expect our citizens to gather in mass at city hall and burst into joyful song about our fair city, we do have the opportunity to express our appreciation to current city council members standing for re-election. Kelly Callison, Rick Chinn, Warren Gooch, Derrick Hammond, and Ellen Smith have earned the right to continue “running” our elected government. We have a certain civility between the city and the various federal entities operating within our borders. Our economy is growing. The various city departments are responsive to the needs and requests of our citizens. In turn, these departments are also being treated with respect as to meeting their desires for improving their services. Each of these individuals has his or her own idea of improving what Oak Ridge should do as a governmental body. But each of them shares a vision of unity which has led to our positive outlook as a city. Why “repair” something that does not need fixing? At Thursday evening’s League of Women Voters forum for state legislative candidates, one of the questions was about increasing minimum wage to $15 per hour. Tennessee has no state minimum wage, so the federal minimum of $7.25 per hour applies here. Minimum wage isn’t a local government issue, since state law prevents cities and counties from mandating a minimum wage, and anyway it wouldn’t make sense for a place like Oak Ridge to require a wage higher than that in the community next door. The summer I was 17, I had a retail job that paid the federal minimum wage. According to the Bureau of Labor Statistics Consumer Price Index Calculator, the hourly wage I received back then was equivalent in buying power to $10.36 in September 2018. That’s substantially more than the current federal minimum of $7.25 per hour. Notably, a full-time worker getting $10.36 an hour should be able to afford a place to live here in Oak Ridge (unlike full-time workers getting $7.25, who are getting turned down by landlords who judge that they don’t make enough money to pay rent). Over the last 80 years (since it was first enacted in 1938), the U.S. minimum wage has set a floor on the wages and salaries for all American workers (employers who want workers with more than minimum qualifications typically need to pay more than the minimum in order to attract and retain good employees), and helped create and support the middle class. I think our nation and state need to start raising that floor again, because hard-working people should not have to depend on charity to survive, and they deserve to have the resources to be good parents to their children, be good customers for business, and good contributors to the community at large. Four of the City Council candidates responded to questionnaires from the Progress PAC and participated in interviews with the organization’s board members. Visit the Progress PAC Facebook page to read our questionnaire responses and compare candidates. The Oak Ridge Civic Center Recreation building will be closed Saturday, August 1 through Tuesday, August 4, 2015, for gym floor refinishing. This includes the gymnasium, game room, all meeting rooms and the indoor swimming pool. The indoor swimming pool will reopen on Wednesday, August 5. The offices, meeting rooms, and game room will reopen Thursday, August 6, at 8:00 am. The gym will remain closed until Monday, August 10. Visitors to the Civic Center Recreation Building will need to use the main entrance that faces the fountain. Staff will be located at the Scarboro Community Center at (865) 425-3950 and the Oak Ridge Senior Center at (865) 425-3999. We do accept TV’s (flat panel, plasma,LCD’s etc but NO TV cabinetry), microwaves, mixers, phones (corded, cordless, and cellular), entertainment goods (VCRs, DVD players, radios, speakers. The International Friendship Bell in A.K. Bissell Park is special. 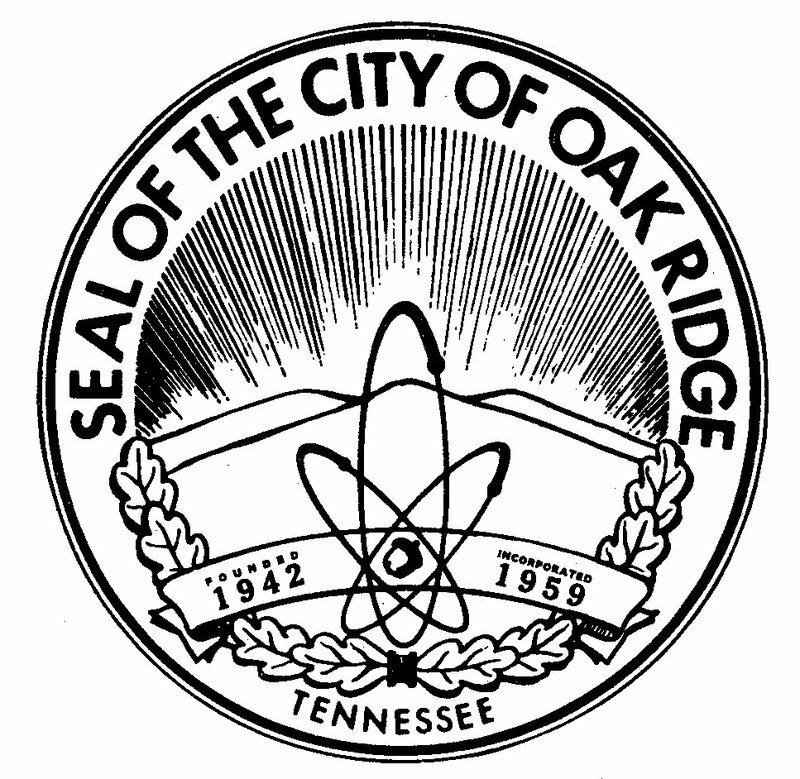 It’s unique, it has substantial aesthetic value, it symbolizes principles (peace and friendship) that everyone ought to embrace, and it is quintessentially Oak Ridge. If anything erected in the city during the decades I’ve lived here deserves to be revered in the future as a historic landmark, it’s the bell and the structure that houses it. I was very disappointed by the news that the wooden bell structure had deteriorated and was no longer safe. The bell will be “out of commission” for some time — until the community rebuilds its support structure. I am one of the many people who believe that the structure should be rebuilt according to the original aesthetic design, but with structural members that will not succumb when exposed to the elements. Like the bell itself, which is decorated with images of both Japan and Tennessee, the structure is not purely Japanese in its design — it’s a blend of Japan and Tennessee. Architect Jon Coddington designed the bell house to incorporate elements of traditional temples in Japan and traditional cantilever barns in Tennessee. The blend of Tennessee with Japan in the structure’s design emphasized the bell as a symbol of international friendship — and the design was an important element of the campaign to dispel fears of local residents who saw the bell as a Buddhist religious item or as some sort of “apology” to Japan for Oak Ridge’s role in the Hiroshima bombing. I hope that the original structure can be reassembled around (and disguise) a rugged steel frame that can support the bell for many decades to come. This is an “interesting” issue for city government. The bell was cast and the structure was built with private donations (here and in Japan), and it was placed on public land as a gift to the city. That makes it a city responsibility now, although the original donors still have a strong sense of ownership. 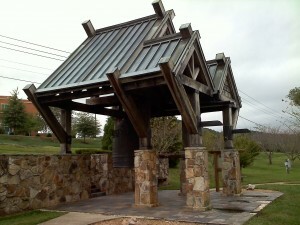 I didn’t donate to the bell when it was created (I was a lot younger then and hadn’t lived in Oak Ridge very long — and this was a project of an older generation of Oak Ridgers), but I will happily donate now to the structure’s restoration because I appreciate the bell’s meaning and value. The bell housing can’t be restored without the help of local donors, but it may not be necessary to find donors to cover the whole cost. I was pleased to see that city government and some citizens with a particular interest in the bell have been creative in seeking additional funds and have discovered a grant-making foundation that looks like an excellent prospect for assisting our community with restoring the bell. The Japanese World Exposition 1970 Commemorative Fund awards matching grants for projects around the world that are related to Japan and that promote international mutual understanding. 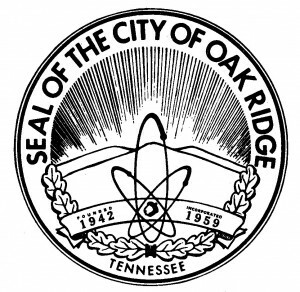 At Monday evening’s City Council meeting it was reported that it probably is too late to apply for this year’s round of grants, but Oak Ridge should be an excellent candidate for a grant next year. People who have been waiting to safely dispose of hazardous household items have a second chance this year. Anderson County Solid Waste Management is holding a Household Hazardous Waste Collection on Saturday, September 27, 2014, 9 am to 2 pm, at the Oak Ridge Public Works building at 100 Woodbury Lane (behind the K-Mart shopping center). According to the announcement, Household Hazardous Waste is anything generated in the household that has a hazardous property. 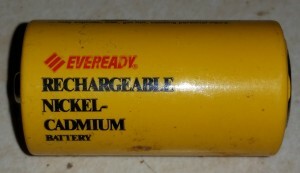 A material is hazardous if it is flammable, corrosive, toxic, or reactive with heat or contact with metals. HOUSEHOLD: CLEANERS, DRAIN OPENERS, POLISHERS, DISINFECTANTS. HOME IMPROVEMENT / MAINTENANCE: ADHESIVES, STRIPPERS, THINNERS, REMOVERS. 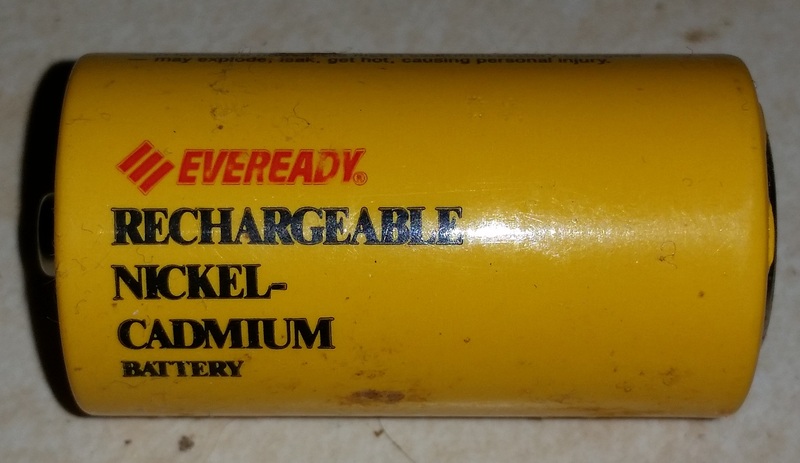 Note: Items marked with asterisks(*) are accepted on a year-round basis at Anderson County’s Blockhouse Valley Road facility. Don’t show up with commercial or agribusiness waste. However, Conditionally Exempt Small Quantity Generators are eligible to participate by appointment. Contact Clean Harbors Environmental Services at 615-643-3180 with a waste inventory to request a price quote and schedule an appointment. The answer to a question that has come up in conversation lately: Why does Tennessee hold its August elections on Thursday? It seems that Thursday was specified in the 1796 state constitution — and it’s still in the state constitution. No one knows why that day was chosen. Whatever I’ve been up to lately, it’s clear I haven’t been doing much blogging. So what have I been up to? Here’s a partial list. EQAB is about to finalize the first report on Oak Ridge’s progress in implementing the climate action plan and meeting the greenhouse gas reduction goals that City Council adopted in 2009 and 2010. The city and the community are on track to meet the first greenhouse gas goals that we adopted for 2015. That’s good news, but the goals for 2015 were modest ones — baby steps toward what needs to be done over the longer term. I’ve been fretting about events surrounding the May 6 county primary election in Anderson County. The way things used to be, our local newspaper would publish profiles of the competing candidates in local elections — so voters could see a factual report on who was running (at a minimum, the paper would provide basic facts like name, address, age, and occupation). Apparently those days are over — it looks like our local newspaper is no longer attempting to provide election guides. (I hope I’m wrong on that — but since early voting is almost over, a guide published now would be almost too late.) It used to be that the League of Women Voters would hold campaign forums where people could hear all of the candidates in an impartial setting, but this year one of the county’s political parties decided to schedule its own “forum” the same evening as the LWV’s forum. It used to be that local candidates tried to deliver positive messages about themselves, rather than publishing attacks at their opponents, but this year we’ve even received attack ads from candidates for judgeships. All in all, I think it’s harder than ever for voters to make good, informed decisions about the election. And I joined a volunteer crew that pulled up garlic mustard in the greenbelt behind the Garden Apartments (now known as the Rolling Hills Apartments). Garlic mustard is an introduced plant from Europe that’s an invasive weed in this area — it threatens to out-compete our woodland spring wildflowers. It’s not common around this areas, but there’s a population behind the Garden Apartments, in an area that has a pretty amazing collection of spring wildflowers. After several years of volunteer effort, we just might manage to eradicate this weed. At this evening’s City Council meeting, the Oak Ridge Fire Department just announced that the city has received an ISO rating of “2”. That may not mean a lot to people, but it’s good news for all of us. I’ve learned that ISO ratings of fire departments are an indication of a community’s fire protection effectiveness. A “1” is the best possible rating, but “1”s and “2”s are very rare, and a “4” is generally considered to be the best rating that most communities can aspire to. Thus, a “2” means we have unusually good fire protection. Also, because many insurance companies use the ISO ratings in setting their fire insurance rates, this “2” rating is likely to save us money on our insurance! Hurray for the ORFD — and the public works department that maintains the infrastructure that helps make this happen. League of Women Voters – O.R.